Michael Sailstorfer, Himmel Berlin [Berlin Sky], 2012. Truck tire inner tubes, dimensions variable. Courtesy of the artist. The exhibition CLOUDS AND TEARS radiates around what artist Michael Sailstorfer calls a solar cat. Perched in the rafters, the animal reaches it’s closed eyes toward a neon light as though absorbing its ecstatic energy. The meditative stillness generated by the cast-aluminium felis silvestris embodies the experience of pure consciousness around which Sailstorfer arranges his poetic version of a metaphysical universe. Masks that stylistically reference African and Oceanic art or post-apocalyptic robots encircle this moment of feline-introspection. As an object used to either disguise or ceremonially transform, the mask emphasizes the individuated identity of the wearer through its concealment. These masks are sand-cast in aluminium, bronze or iron from quickly drafted cardboard figures in a process that preserves the textures of the humble materials. The visual signatures of their ephemeral origins are thereby preserved and layer meaning vis a vis the patina of their physical qualities. Moving out from the centre, Sailstorfer takes us from consciousness to identity to time, whose inescapabilty is recorded by the spinning of the tire in Zeit Ist Keine Autobahn–Mexico City. This passenger car tire, fastened to a motorized engine spins full throttle against the white gallery wall. Unable to move through space, the tire immolates in slow motion, flinging particulate and the smell of burning rubber—its relatively diminutive form asserting omnipresence throughout the gallery. Invisible but perceptible, the smell of burning rubber acts as allegorical reference to the passage of time which the tire clocks via the destruction of it’s wearing treads. Is time a destructive force or rather transformative one that allows the tire to transcend the limitations of its physical body? Finally, beyond the orbit of time, two more pieces, Tränen [Tears] and CLOUDS, comprise the final order of weight or gravity—the force that binds universes together. Tränen is a video of three two-ton cast iron teardrops falling on a home in Bavaria, reducing it blow by destructive blow to dust and rubble. 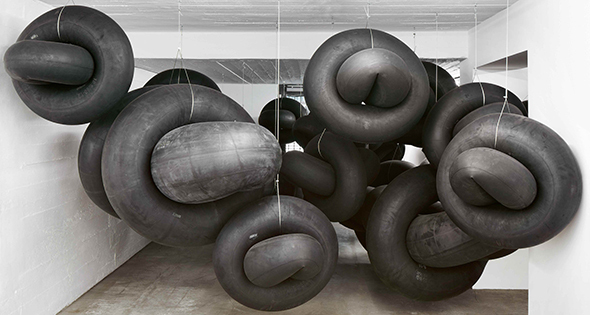 Meanwhile, the site-specific CLOUDS, metaphorically imports the heavy Berlin sky to Mexico City by way of large black clouds made of looped truck tire inner tubes. Both works display a disarming cartoonishness that does not immediately belie the weight of their sadness. With unrealistic formal simplification and exaggeration they strike at the heart of Sailstorfer’s poetic sensibilities. In these works he manipulates refuse of the Anthropocene to reveal emotional depth and complexities in humanity’s destructive tendencies. They gesture then, toward destruction as a means of revealing the pathways to a new order that shifts the orientation of ontological understanding toward one that is simply, but no less radically, not human-centred.